All, all of a piece throughout; Thy chase had a beast in view; Thy wars brought nothing about; Thy lovers were all untrue. ’Tis well an old age is out, And time to begin a new. Joy ruled the day, and Love the night. A virgin-widow, and a mourning bride. Since every man who lives is born to die, And none can boast sincere felicity, With equal mind, what happens, let us bear, Nor joy nor grieve too much for things beyond our care. Like pilgrims to th’appointed place we tend; The world’s an inn, and death the journey’s end. Fool, not to know that love endures no tie, And Jove but laughs at lovers’ perjury. But love’s a malady without a cure. She hugged the offender, and forgave the offence. He trudged along unknowing what he sought, And whistled as he went, for want of thought. Refined himself to soul, to curb the sense And made almost a sin of abstinence. One of our great poets is sunk in his reputation, because he could never forgive any conceit which came in his way; but swept like a drag-net, great and small. There was plenty enough, but the dishes were ill-sorted; whole pyramids of sweetmeats, for boys and women; but little of solid meat for men. ’Tis sufficient to say, according to the proverb, that here is God’s plenty. A perpetual fountain of good sense. [Chaucer] must have been a man of a most wonderful comprehensive nature, because, as it has been truly observed of him, he has taken into the compass of his Canterbury Tales the various manners and humours of the whole English nation in his age. We can only say that he lived in the infancy of our poetry, and that nothing is brought to perfection at the first. What judgement I had increases rather than diminishes; and thoughts, such as they are, come crowding in so fast upon me, that my only difficulty is to choose or reject; to run them into verse or give them the other harmony of prose. Arms, and the man I sing, who, forced by fate, And haughty Juno’s unrelenting hate, Expelled and exiled, left the Trojan shore. 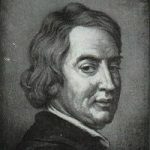 John Dryden was born in Aldwincle, Thrapston, Northamptonshire, England. He was an English poet, literary critic and playwright who was made England's first Poet Laureate in 1668. He earned a BA degree from Trinity College, Cambridge University in 1654. He wrote several poems include: Annus Mirabilis, Absalom and Achitophel, The Medall, MacFlecknoe, The Hind and the Panther, Eleonora, and Fables Ancient and Modern. He wrote several plays include: The Wild Gallant, The Indian Emperour, Secret Love, or the Maiden Queen, Tyrannick Love, The Conquest of Granada by the Spaniards, Marriage A-la-Mode, Aureng-Zebe, All for Love, Oedipus, Don Sebastian, Amphitryon, and Love Triumphant.